What a classy museum the Freer is! It's the only museum I went to that didn't have hundreds of school kids traipsing through, or tourists doggedly fulfilling their cultural obligation. There were no people making fun of the work either, like I encountered at the Hirshhorn and American Museums. (Why these people bother going to art museums I’ll never understand.) 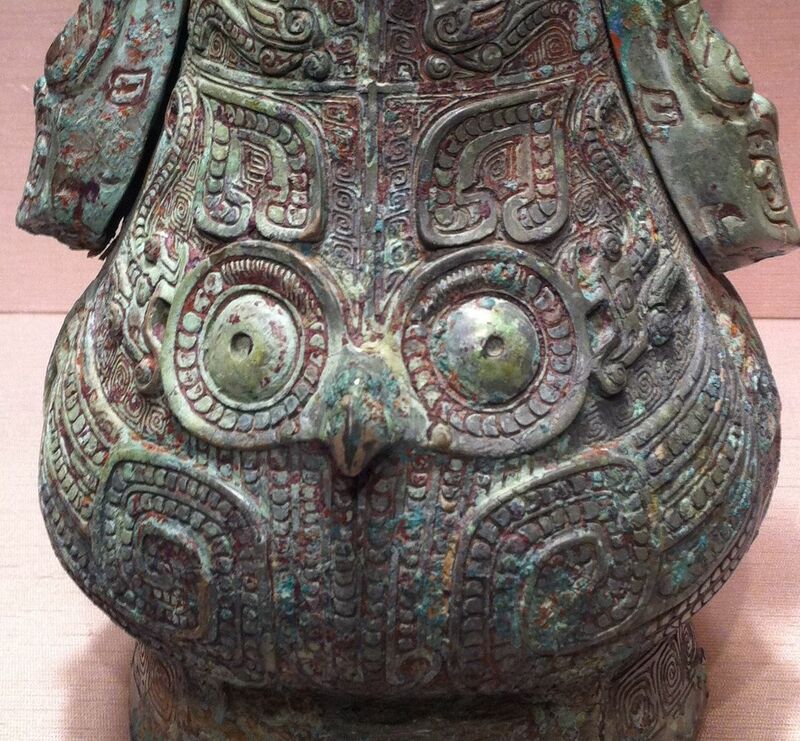 Instead the people at the Freer were knowledgeable lovers of Asian art. The Freer is quiet and well lit, and the galleries are orderly without being repetitious. There are even comfortable chairs you can rest in under a shady loggia overlooking a beautiful courtyard. Like I said --- classy. My only complaint is most of the hanging silk paintings are covered with glass that makes it difficult, sometimes impossible, to see the older, dark Chinese paintings without being distracted by reflections. 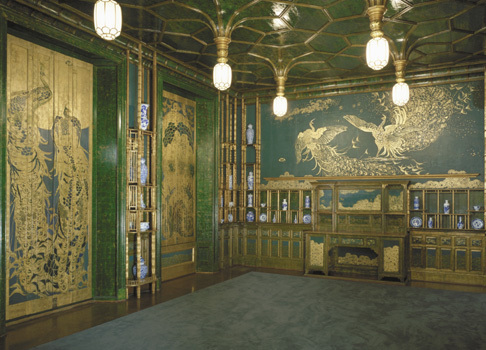 They also have more than one thousand works by James McNeill Whistler (yes, that Whistler — the Whistler of Arrangement in Grey and Black fame), including The Peacock Room, a lavish London dining room painted by Whistler in 1876–77. Whistler’s art was heavily influenced by Asian art and he encouraged Charles Lang Freer, founder of the Freer Gallery of Art, to collect it; hence the connection. These caves were one of the great achievements of the 6th century Northern Qi dynasty. They once contained monumental Buddhas, divine attendant figures, and crouching monsters that were carved into the mountains of northern China. Tragically, they were destroyed in the first half of the twentieth century when the sculptures were chiseled away and sold. With the aid of 3D imaging technology and several fragments of the sculptures on view, this exhibition captures some idea of what this awe-inspiring devotional site must have been like. From one of the best museums, the Freer, to one of the worst. I don’t mean the collection, which isn't great (Hirshhorn was infamous for seeking bargains) but has some good things. It’s the building I have issues with — it’s bad even by the low standards of modern art museums. In addition to my earlier complaints about a boisterous atmosphere, poorly proportioned, odd-shaped rooms, and a distracting and wasteful atrium, the building is doughnut-shaped so it feels like you’re walking down an endless corridor rather than viewing the work in separate rooms. (The de Young Museum in San Francisco has the same problem, but that’s a rectangular space so they have even less of an excuse.) To make matters worse, the interior wall is all windows (looking out over a dreary courtyard), and as a result, the galleries are so busy and distracting it’s almost impossible to focus on the work. They have five major Clyfford Still paintings in their permanent collection, several given to them by Still. Thankfully they’re hung in their own, relatively private, room. This is the first retrospective of German abstract artist Peter Schwartze, aka Peter Heisterkamp, probably best known by the name his teacher, Joseph Beuys, gave him: Blinky Palermo. Even though this work is conceptual and minimal, there’s a nice, free-wheeling spirit to his exploration of decoration and modernism. It’s sad he died so young (33) — it would have been interesting to see where he’d go with all this. 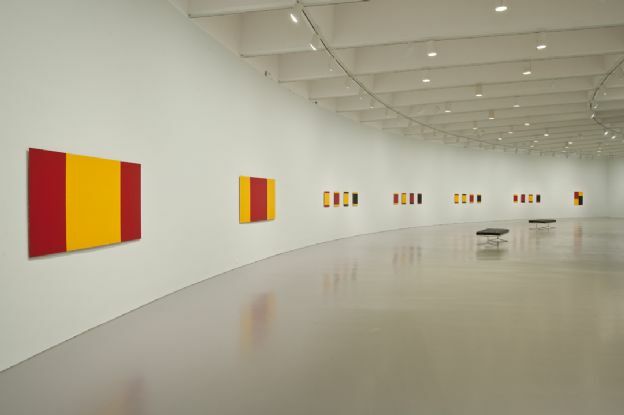 This show is composed of works from the Hirshhorn's collection and is supposed to “explore the ways in which color has been an essential tool for artists, regardless of medium,” to quote from the catalog. Half the work in the show is black and white (or may as well be) — enough said. They supposedly have a great collection of African art originally collected by Paul and Ruth Tishman and sold to Disney for its Epcot Center but never installed there. Ultimately Disney gave the collection, all 525 objects, to this museum. I was not able to find it, and I couldn't find anyone to help me either. I really have no idea what this museum is about. The shows I saw were a mishmash of contemporary art and traditional (what we used to call "Primitive") art, jumbled together by some flimsy theme like “Technique and Object” or “Movement and Gesture.” I think Holland Cotter had a good point in his recent Times piece about how contemporary African, Chinese and Indian art is supplanting traditional art. That is certainly the case here. 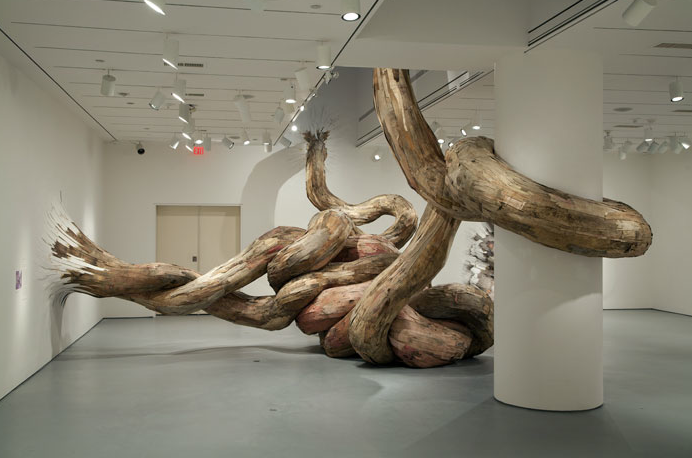 One interesting installation piece I stumbled on was by Henrique Oliveira, a Brazilian artists of all things. There was no justification for it being at this museum as far as I can tell, but it was an impressive piece. The American Indian Museum is mainly a cultural museum like the American History Museum, and it is another example of Holland Cotter’s argument. If you’re hoping to see some Northwest Coast Indian art, or other American Indian traditional art, you’re better off going to The George Gustav Heye Center in the old Alexander Hamilton U.S. Custom House, One Bowling Green, in New York. 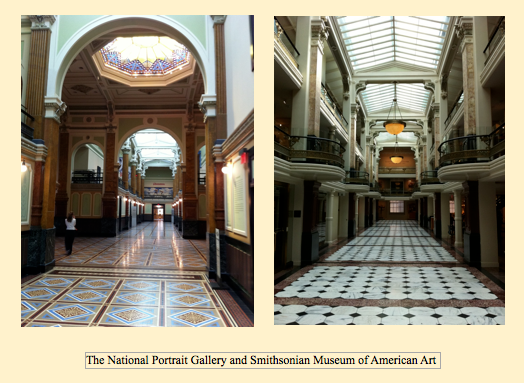 The American Art Museum and the National Portrait Gallery share a block-long, historic, beautiful building with a large covered courtyard. They’re located a few blocks north of the National Gallery, in the heart of the hip and bustling Downtown. The museum also gives a chance for lesser known but deserving American artists to get shown, artists like Paul Wonner whose work is best illustrated in a close-up detail. 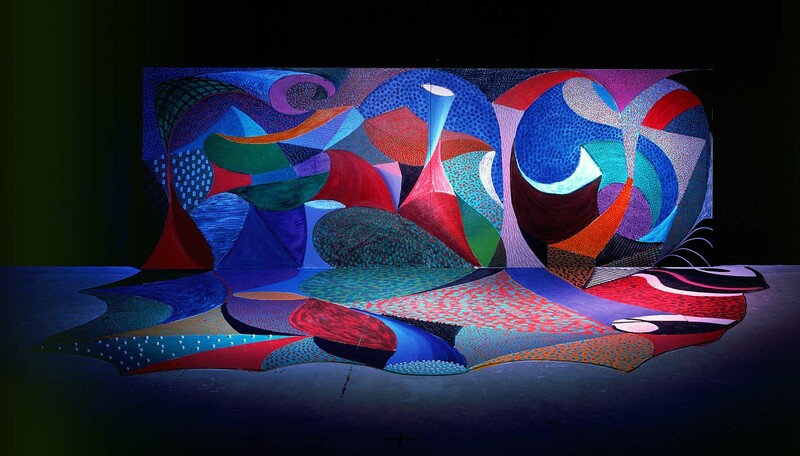 The American Museum has organized Rockman’s first major survey, and it includes 47 paintings and works on paper from the mid-1980s to the present. I don’t think this survey does him any favors; seeing his work in quantity makes me realize how much like illustration it is. Rockman built his career around environmental issues, and they’re good environmental illustrations, beautifully painted and all — but illustrations nonetheless. As one would expect of a portrait museum, art isn’t the major issue here. There’s just as much or more emphasis on the sitter (presidents, famous actors, historic figures, etc.) as there is on the artist. Nevertheless, there is a lot of great art to be seen here. 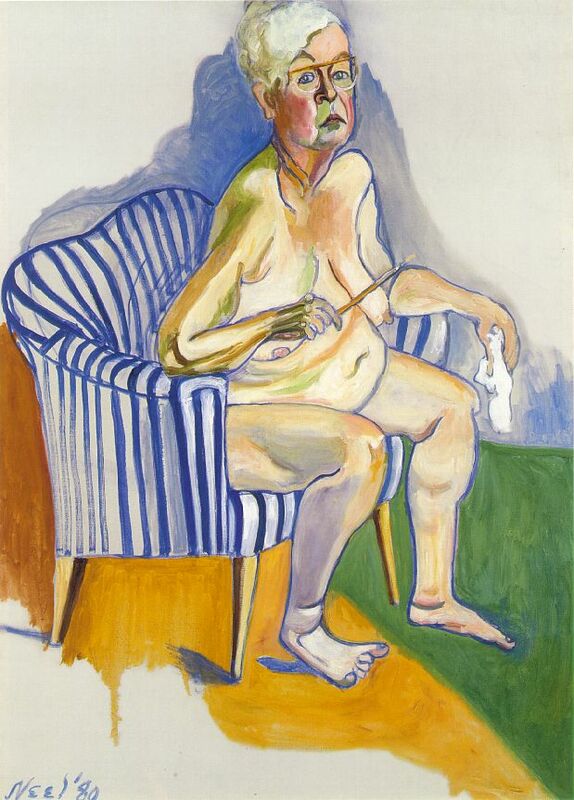 I forgot how many contemporary artists have made portraiture a major part of their oeuvre. 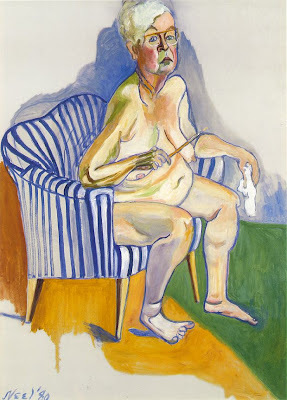 Off the top of my head, there’s Chuck Close of course, but also Andy Warhol, Alex Katz, David Hockney, Alice Neel, Lucian Freud, and the way over-rated Elizabeth Peyton. And these are just the painters; there are a lot more photographers. This exhibition was the last one I saw, and one of my favorites. 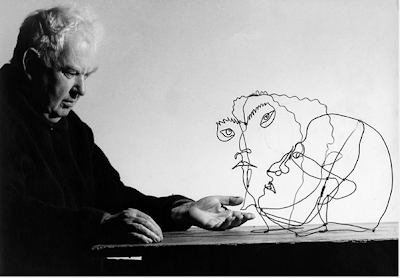 Calder's wire portraits are an absolute delight: inventive, playful, masterful caricature. Even the shadows they cast were considered and fun. Calder clearly enjoyed doing these, and he continued to do them even after he moved to abstraction in the 1930s. 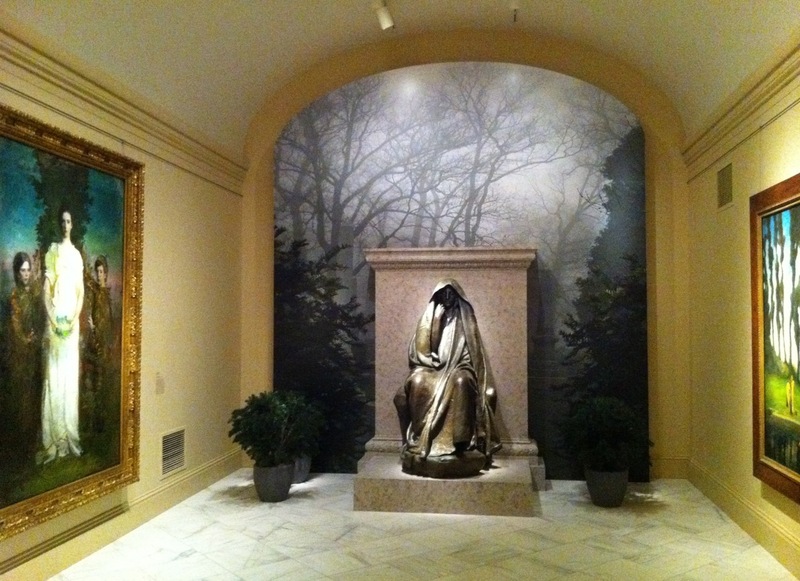 Next post: A day trip to the Washington Museums -- tips and details. I went in the middle of February; no crowds. I may be wrong about this, because I ran through the Hirschorn, (and the rest) but i thought that the work was given more, or different "conceptual" space than exhibits in NY that tend follow orthodox narratives. Maybe because they were bargains, the way they're displayed is looser. I realize this is a "Do you know what I mean" type of comment. I see what you mean by a "Do you know what I mean" type comment. Thanks again for day 2 of the tour. 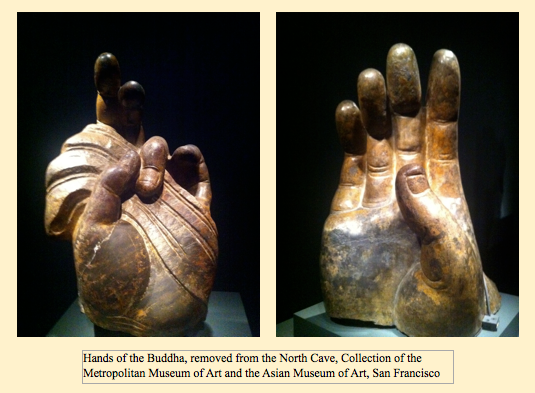 You certainly saw a lot in the two days you were in D.C. Do you have any idea how large the Hands of the Buddha are? It's difficult to make out the scale. 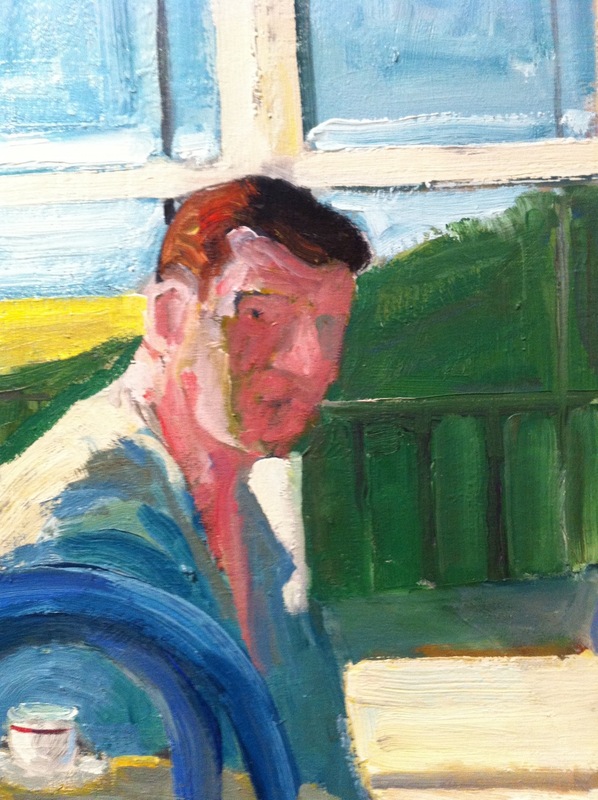 Also,the Paul Wonner detail looks like a beautiful painting.Will look him up and see what I can find. The Buddha hands are about 1 - 1 1/2 feet tall. I couldn't find them on the Freer/Sackler website, so this is only an estimate from memory. They were pretty spectacular. Just now catching up with your travels--great report on the DC visit, sounds much more inspiring than doing Easter eggs! Don't you love the fact that so much of that great art belongs to us, the citizens of the US of A? And didn't you see some treasures, "The Old Musician" not least among them? But wait, there IS some great art in NYC now--check out Sir Anthony Caro at the Met, looks like it might be worth a visit (or two). I do love that so much great art is owned by the citizens of the US of A,, but I worry about how good we are as stewards considering what a stir the relatively tame David Wojnarowicz’s "A Fire in My Belly" video has caused [http://latimesblogs.latimes.com/culturemonster/2010/12/controversy-over-video-censored-by-smithsonian-continues-to-build-steam.html]. There might be some art in NYC after all! 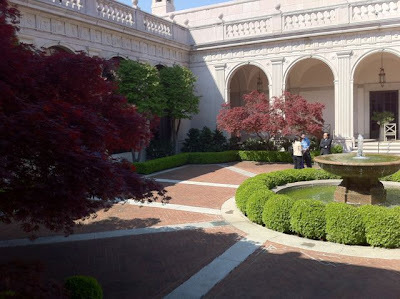 As per your suggestion, I spent the day at the Met and saw the Caro sculpture show, and also the Serra drawing show. But I spent most of my time looking at the African art. I didn't get my fix in Washington, but the Met fulfilled my cravings in spades. (More on that too later). FYI re Easter eggs, this atheist Jew not only made Easter dinner for some friends (ham of all things), but last week made a full Passover Seder doing the full haggadah and serving gefelta fish,kosher matzo ball chicken soup, kosher roast chicken. tsimmes, kugel -- the works!!! Who said you can't do it all? What an amazing piece that Bololo is! What the heck is it doing in that museum though? Strange. But I can't take my eyes off that piece. It' s a sort of sinuous, sensual globular root system that breaks through the walls and fills the space. But what is so amazing is the work that appears to have gone into it. Was it as clean as it appears to be? Jew at Seder? Ham at Easter? Pick one.